The 2018 midterm elections were heralded as a triumph for democracy itself, with record numbers of voters turning out to the polls and, in multiple states, passing measures to expand voting access. The last few weeks have been less inspiring. 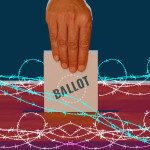 Florida counties and state officials are talking past each other, unsure of how to proceed weeks after Sunshine State residents voted to restore voting rights to convicted felons who completed their sentences, the Tampa Bay Times reported Tuesday. 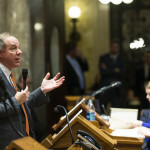 After a frantic, extraordinary 22-hour legislative session, Republicans in the Wisconsin Assembly on Wednesday morning joined their Senate colleagues in passing a sweeping package of bills intended to curb the authority of incoming Democratic Gov. Tony Evers. The legislation now goes to the desk of departing Republican Gov. Scott Walker, who has signaled he will sign off on it before he leaves office in early January. A recent flurry of alarming headlines about looming Republican power grabs have focused on two states: Wisconsin and Michigan. The GOP-controlled legislatures in those states have an inglorious history of using the majorities they locked in through gerrymandering after the 2010 election cycle to steamroll their policy priorities through. But there is a more specific reason why those specific states are running full speed ahead with this activity during the current lame-duck session. Wisconsin and Michigan are two of only four states that lost trifecta control of state government — meaning the governor’s mansion and both chambers of the legislature — as a result of the November elections. Legislatures in the other two — Kansas and New Hampshire — elected to not convene until next year, the Associated Press reported. Thanks in part to the aforementioned gerrymandering, Republicans in both Wisconsin and Michigan managed to win fewer votes than Democrats but maintain control of both the House and Senate in their states. 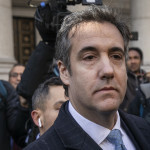 But Democrats swept the top offices in both states, winning the governorship, secretary of state, and attorney general contests and securing the power to veto or block overreaching Republican legislation. So the GOP in both states is trying to shove these changes through in the weeks before the new administrations are sworn in. Both states have seen bills to curb the authority of these incoming statewide officials and also lock in GOP legislation passed under the prior administration. In Wisconsin, a grab-bag of proposals aims to limit early voting, allow the GOP to hire their own private lawyers in lieu of relying on the attorney general’s office, and pack state boards with their own appointees (among many other measures). Michigan Republicans are targeting the slate of progressive proposals that voters overwhelmingly approved on the November ballot, from overhauling the redistricting process to same-day voter registration to a significant minimum wage raise and sick leave policy. The other state legislature that is making notably sneaky moves is, unsurprisingly, in North Carolina. The GOP legislature there created the playbook for lame duck efforts at undermining incoming Democratic leaders back in 2016 when Governor Roy Cooper was elected to replace Republican Pat McCrory. The Republican-controlled legislature attempted to limit Cooper’s power to make appointments to the state elections board and other key panels. Its latest scheme involves trying, again, to ensure that Republicans will have the chair of county election boards during election years. A similar effort failed in 2016 after Cooper filed a lawsuit and a panel of state judges ruled in his favor. Democrats now have a majority on the state supreme court, making this latest bid unlikely to succeed. On November 6, Michiganders overwhelmingly voted to expand access to the ballot in their state and put an end to partisan gerrymandering of districts. But that’s not stopping Republicans in the legislature from targeting those citizen-approved measures before Democrats take control of key statewide offices on January 1. As Republican lawmakers in Wisconsin move forward Tuesday with plans to rush votes on bills to lock in their power during the lame duck session, outgoing Gov. Scott Walker is affirming he’s on board. 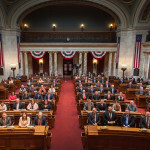 Tensions are escalating in the Badger State as Republican lawmakers plow ahead with a brazen legislative power grab during the lame duck session.